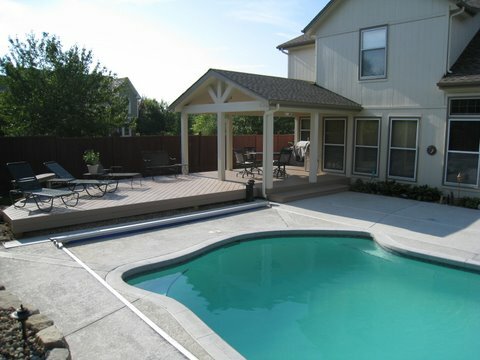 This open porch adjoins with the pool deck allowing ease of movement between the 2 living areas. 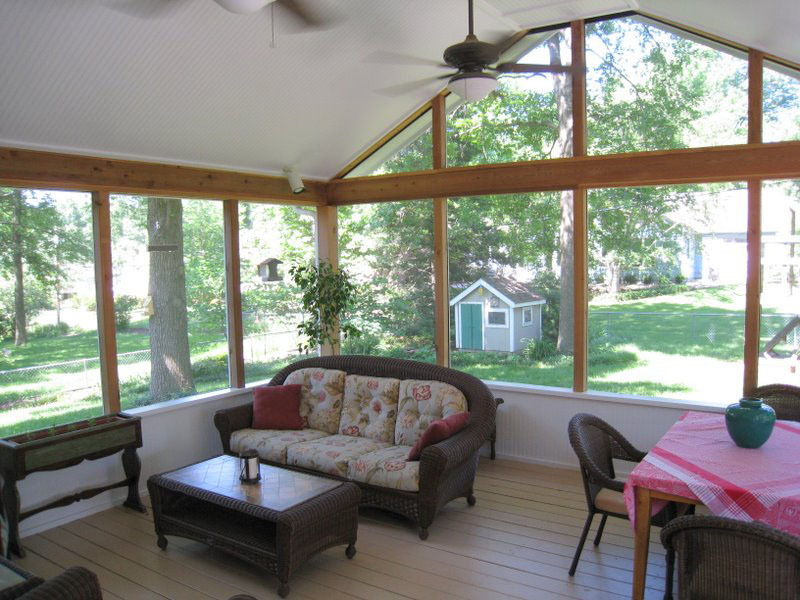 Open porches and screened porches have many similarities in that they are both roof structures, can both be attached or detached, and both provide sun protection. Here are some key differences you may want to consider if you’re determining which you want to add to your home. One consideration is bug protection. 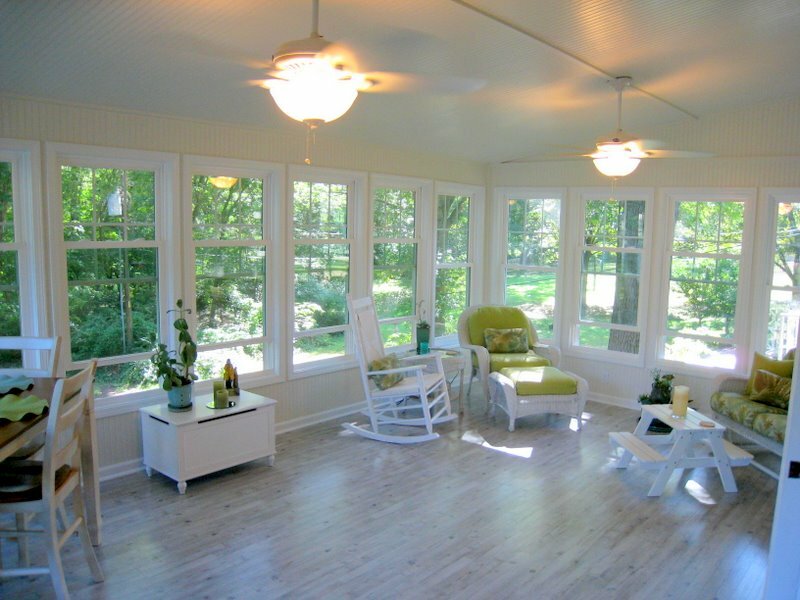 An open porch, sometimes called a covered patio, will not provide bug protection without the addition of a bug protection device such as mosquito curtains. Depending on your yard and the elevation of the porch, mosquitoes and other bugs may or may not be a problem. If your open porch will be at the second-story level or above, bugs may not be an issue. They tend to stay lower to the ground. 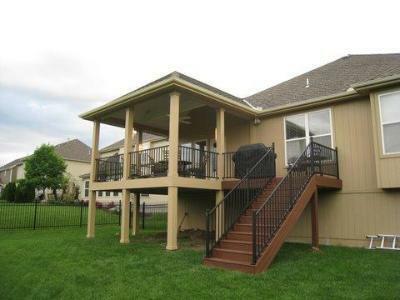 This open porch in Lenexa provides a great view of the back yard. Another consideration is that an open porch feels different. Without the screens there’s slightly more visibility and less privacy. 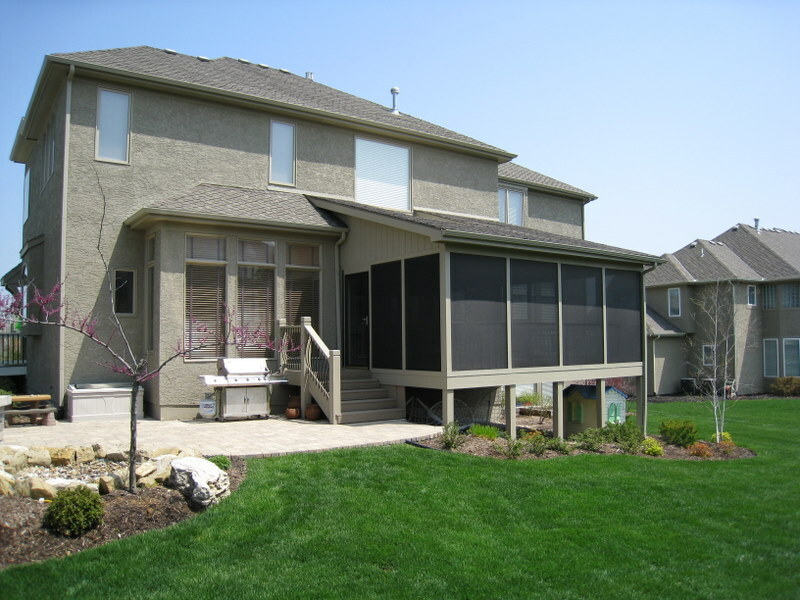 But, if the porch is adjoining to a deck or patio, you may not want a screen wall obstructing easy communication or access between both living areas. Another reason you may not want to restrict access if you are entertaining in both spaces. The ambiance is different if the 2 spaces are separated by screens. 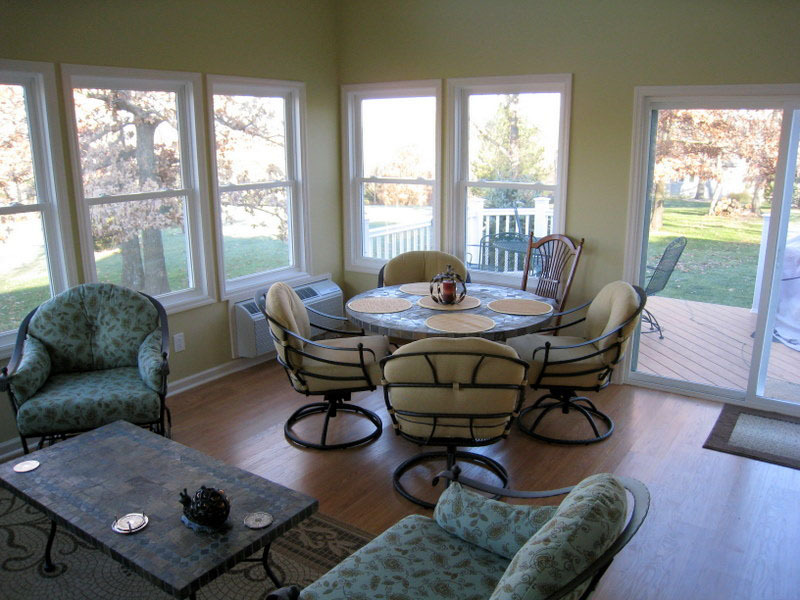 On an open porch, you have more trim work and column options. Posts can be trimmed to have a more finished look. They can also be farther apart allowing for different spacing between the posts. Columns become an option when you do not need to attach screens. 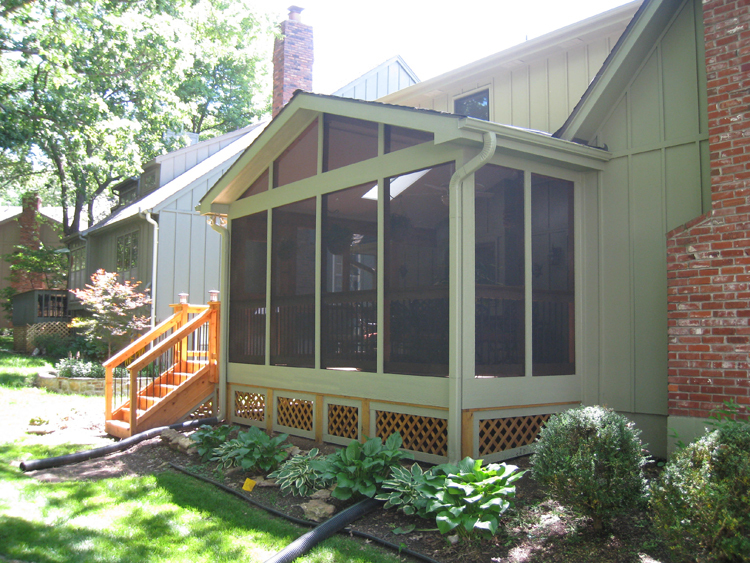 If you are considering addition a porch to your home, give us a call for a free consultation. We enjoy working with homeowners to provide information that will help in making decisions. Give us a ring at (913) 851 – 3325 or send us an email at kansascity@archadeck.net. We look forward to your call. 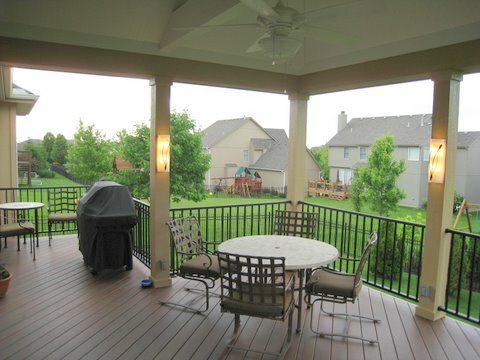 Take a look at more pictures in our open porch photo gallery or screened porch photo gallery on the Archadeck of Kansas City website. This entry was posted in Open porch, porches and tagged Archadeck KC, Archadeck of Kansas City, Kansas City porch builder, Kansas City screened porches, Screen Porches, screened rooms on June 14, 2012 by archadeckkansascity. I was at a customer’s home this week and they wanted to build a new porch on the back of their Kansas City home. Their house was on a pie shaped lot that became narrower as it went back and came to a point in the very back. When I measured the distance from the corner of the new porch to the rear property line it was only 12 feet from that point. I checked with the city the project was in and they indicated that it was too close and could not be built. This reminded me of several other projects that were complicated by setbacks and utility easements. A setback is the distance that a completed project must be from your property line. Side setbacks can be anywhere from zero feet in some older sections of town to as much as 15 feet in others. Rear setbacks can be even more diverse. 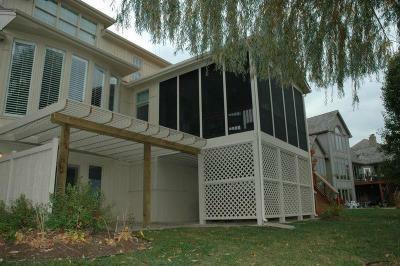 Some cities do not require setbacks for low level decks but can be as much as 30 feet for porches or sunrooms in other cases. In addition, some cities require a percentage of the total lot length not to exceed a certain amount of feet. These setbacks can also vary within the same city. Some subdivisions require greater setbacks than others. Villas and town homes generally have different setback requirements than single family homes. In most cases the city planner is the person to check with on regulations regarding your property. There may be a variance process in place where you can get permission to build your porch if the setback is an issue. In most cases a recent survey will be required. This entry was posted in Screen Porches, Uncategorized and tagged Screen Porches, setbacks on December 17, 2009 by archadeckkansascity.